What Are Paraphrasing and Summarising? Let’s start with paraphrasing. There is a lot of talk about plagiarism in 2016, and it’s hardly surprising: We pretty much all have access to the Internet, and therefore it’s all too easy to load up a web page whenever we’re in need of some fresh content, before copying and pasting the text and claiming it as our own. Of course, we make a few tweaks to the text first, and this is essentially what paraphrasing is: You take an original text, change the words up, but retain the core meaning. It saves you a heck of a lot of time and hassle. Summarising is something else that students, in particular, should be familiar with. A summary is basically a condensed version of a text which emphasizes the main points in your own words. If, for example, you want to summarise a chapter, you might stick to a single page. If you need article summarize, you might stick to just a few lines. 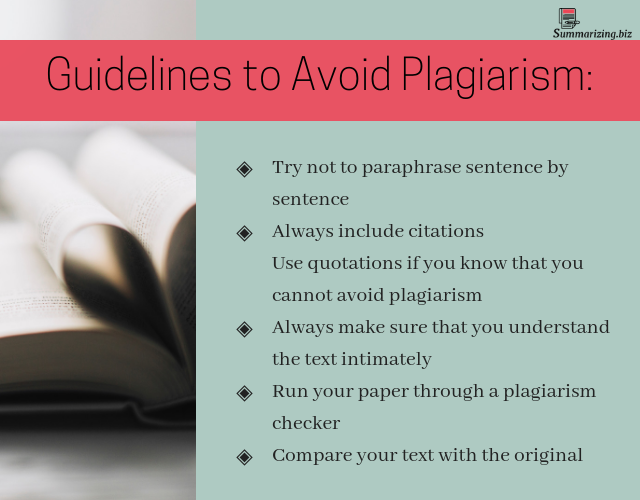 Paraphrasing and summarising are two techniques that help you to avoid plagiarism. But neither is especially easy. So what do you do? Knowing how to summarize news article without plagiarizing is essential if you’ve got a paper to write. Whether you’re working on a blog post or an academic paper, copying and pasting from the Internet is a good idea – but only if you’re skilled at both paraphrasing and summarizing and can, therefore, avoid stealing someone else’s words. Find all the essential information to write professional summaries. If you’re not sure how to summarise without plagiarizing, here are a few of our top tips. Familiarise yourself with the text. Before you begin writing, it’s important that you familiarise yourself with the text in question so that you thoroughly understand it. Understanding the text’s message is essential if you’re going to turn it into your own words. Write the introduction. Begin by writing the introductory part of your paper. You can either claim that the opinion is your own, or you can make it known that you are using a referenced material. If you choose to voice your own opinion, write down an intro in the form of a statement while expressing your viewpoint with consistency and clarity. If you choose to reference someone else, make it clear that your take on things was inspired by someone else. Write your summary without looking at the original text. It’s very important that you write the summary without looking at the original text. Working like this will reduce the likelihood of plagiarism in your text. If you are struggling to remember something, bring up the text and quickly read through it before hiding it away again. We have compiled a list of the steps involved in writing a summary. Follow them and you’ll be on your way to writing an excellent summary in no time. Read for understanding: You can’t summarize a text you lack a thorough understanding of. Read through once to get a complete knowledge of the text’s points before you begin. Read for content: Next, read with a more analytical eye. What are the text’s arguments? How would you sum up what it means? What’s essential and what isn’t? Keep these questions in mind for your reread. Make notes: You can do this either after or during your second reading. Answer the questions you asked yourself, sum up important points, make note of what seems essential. Be liberal; include everything that seems even remotely important. It’s easier to take things out than put them back in. Cross out: Time to weed out what you built up. Anything that seems particularly unimportant to the point may be crossed out now. You will do quite a bit more editing, so you can be gentle with your red pen. Just take out anything that doesn’t seem to contribute much. Outline: Check out your notes and create a structure for your paper based on them. Include everything at this stage, even things you’re not sure about. Edit: Time to cut it down again! Go through and remove everything that seems unimportant. You should remove this before you start writing, so you have less to do when you do write. Do save it in a separate document case you need it later, though. Fill in: Time to write! Go through your outline and expand on your main points piece by piece. This will be your first draft, so feel free to make it a little bit slapdash. You will fix it later. Edit some more: Yes, again. You can do this during the fill-in stage if you like, or you can wait until after. If your paper is too long, remove some of the inessential information. If you’ve cut too much and it’s too short, go back and check your notes. Check your work: Read your text again and compare your paper. Does it convey all the important points and leave out the inessentials? Proofread: Final step: now it’s time to edit out those rough edges. Look for any awkwardness caused by the removal of inessential pieces as well as regular mistakes. A good tip for proofreading is to read out loud or to read your paper backward. This helps you catch things your eye would skim over normally. Writing a good summary is certainly no easy task. It requires critical thinking, the ability to be concise, and a considerable amount of writing finesse. Developing the skill can make you stronger as a reader, too, since it teaches you how to read for the main points. It is a talent that you will have to acquire to succeed. However, you are now much better-equipped to do so than you were before you began reading. You have a better understanding of the steps and can apply them to your own work. However, it’s possible that you still have questions or need some summarizing activities to practice. That’s quite understandable, as this is a complex task which takes time to learn. It’s a good idea to ask for help from your professor, teacher, or a peer that you trust. Our website also has a team of professional writers who can help answer your questions as well. We are always happy to help you at any stage of the process. 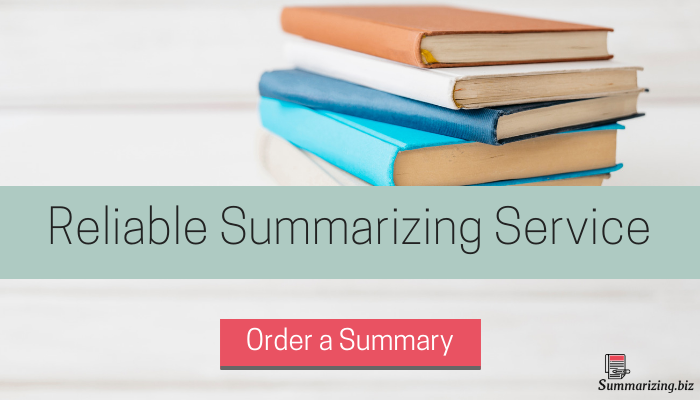 If you want to know how to summarize without plagiarizing, use our website and make an order of our service!